Have you got a bad case of the blues? Click here to play! Well then, it’s time to check yourself in to see Doctor Love, the master of not only the fine, romantic arts, but also the greatest cash jackpots around. Doctor Love is an enticing 5-reel slot played across 9 unique pay lines, with the more lines activated allowing for more winning combinations to be made. The Doctor is Wild and can be substituted for any other symbol on the reels, as well as pay out up to 5000 times your initial stake! The Patients and Nurses are lucrative indeed, with up to 1500 coins available for the best spins on activated lines. 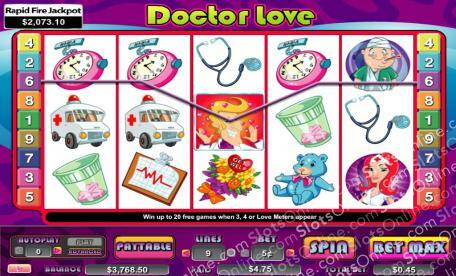 With 10 free games on offer, there is always something exciting to spin up at Doctor Love! The Doctor of Love is Wild and can be substituted for any other symbol on the reels. If you manage all five on an active pay line, you will be rewarded with 5000 coins.